Many patients shy away from the dental procedures they need because of the associated pain. Numbing is available, of course, but even the injection can be unpleasant. 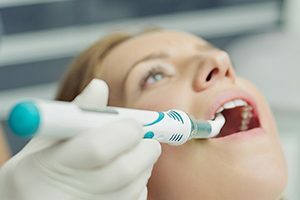 At Lakeside Daytona Dentist, we want to ensure your total comfort at every stage of the treatment process. That’s why Dr. Silva now utilizes a new, innovative technology known as DentalVibe. If it’s been some time since your last appointment, please consider contacting our Daytona Beach, FL office. As our team administers an anesthesia injection, DentalVibe will apply a gentle vibration to the nearby oral tissues. Research has shown that when this type of vibration is occurring simultaneously with an injection, the former sensation reaches the brain first and effectively blocks any feelings of pain. This means that our patients can truly relax in the treatment chair and leave their feelings of dread and fear behind.